The Botanical Wallchart: Art from the Golden Age of Scientific Discovery (London: Ilex); Botanical Art from the Golden Age of Scientific Discovery (Chicago: University of Chicago Press) 2016; 224p, 300 color plates. (from the introduction) More than an archive of illustration and inquiry, this book documents an extraordinary convergence of disciplines that flourished in the late-nineteenth and early-twentieth centuries. Europe was enjoying a golden age of scientific discovery; naturalists were exploring the globe, and there was a clamoring for knowledge of the natural world. A pedagogical curiosity was no longer limited to elite salons and research; education was now considered a right afforded to all, in classrooms across the globe. And thus the botanical wall chart was born: a synthesis of art, science, and education. The book’s chapters are organized by plant family, allowing readers to compare how illustrators from different countries and teaching backgrounds would represent the same species or family, and to learn about basic taxonomy (a summary of the family’s characteristics is included at the beginning of each chapter). In most cases, nineteenth-century botanists grouped species according to a classification system that persists today. In other cases, a species has since been renamed or reclassified—taxonomy is a subject that has long vexed botanists, striving to categorize plant species into groups that reflect their behaviors and evolution. Although Linneaus developed a useful framework of binomial nomenclature, it was only a beginning. Botanists today are still reclassifying and weighing morphological features. Just as species evolve, so does science. Each wall chart is accompanied by long-form captions that offer information about the science featured, the scientists and botanical illustrators who created it, and any particularly interesting or innovative features the chart displays. Horticulturalists and biologists will be pleased to discover useful information about plant anatomy and morphology and species differences. We see lilies and tulips, gourds, aquatic plants, legumes, poisonous plants, and carnivorous plants, all presented in exquisite, larger-than-life detail. 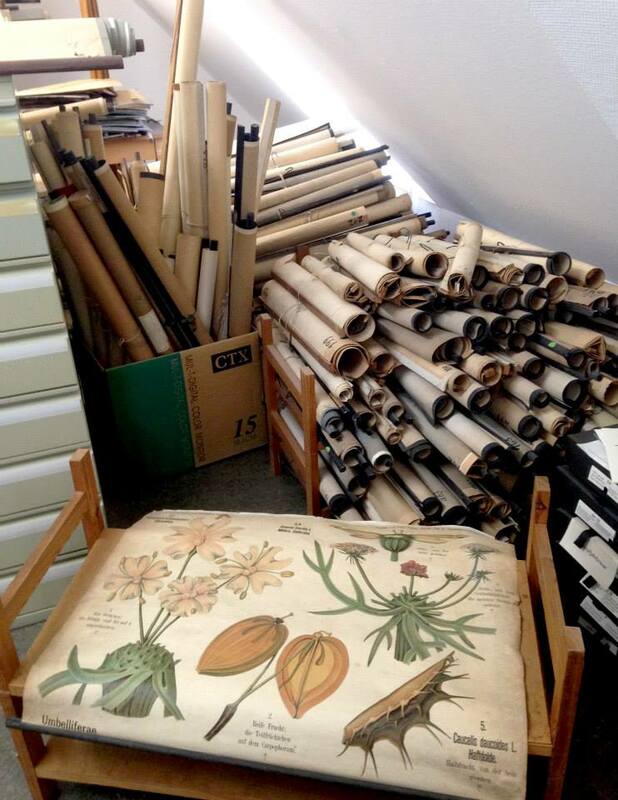 (above) Unrolling & organizing charts in the attic archives at Berlin Botanical Garden & Library was a thrilling and dusty task.